The mango (Mangifera indica) season is full on at Estacion Biologica. It happens twice each year in Nicaragua. The tree above us is dropping about four ripe mangoes onto the roof every hour, including the hours I would prefer to sleep. Mangos are excellent sources of vitamins A (25% of daily recommendation) and C (76% of daily recommendation), and supplies 25% of the recommended daily fiber in a single 1-cup serving (see here for more information). Mangos are also great because they are easily grown without pesticides. The mangos in the US supermarkets might be heavily sprayed (be sure to check), but with reasonable cultivation practices, it is just not necessary (see here for more on organic foods). We have a couple of mango trees and we never spray or chemically treat them. Our mangos might not be picture perfect, but they are delicious. Nicaragua has taught me to enjoy them to the maximum when mangos are abundant. Later, none are to be had. So, it's peeled mangos, sliced mangos (for breakfast), mango juice (for lunch), peeled mangos (any time), mango smoothies, mango tea, mango jam, mango and rum (! 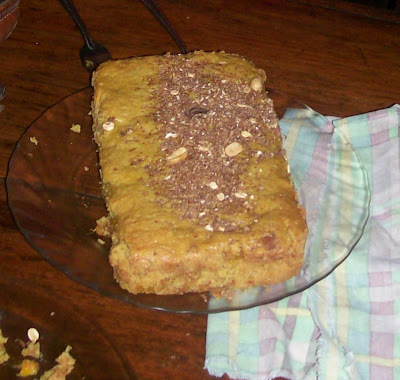 ), and of course, mango pastries. Patricia prepares an awesome mango pie. Foto by Jeffrey McCrary. These mango pieces got a cup of yogurt and then bake time. Photo by Jeffrey McCrary. 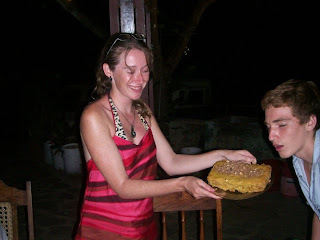 Patricia pulls the mango tart out of the oven as Wyatt pulls a paparazzi. Photo by Jeffrey McCrary. You might get the idea from these pictures that the pie was delicious. It didn't last long. Mangos combine excellently with yogurt, no sugar is necessary. 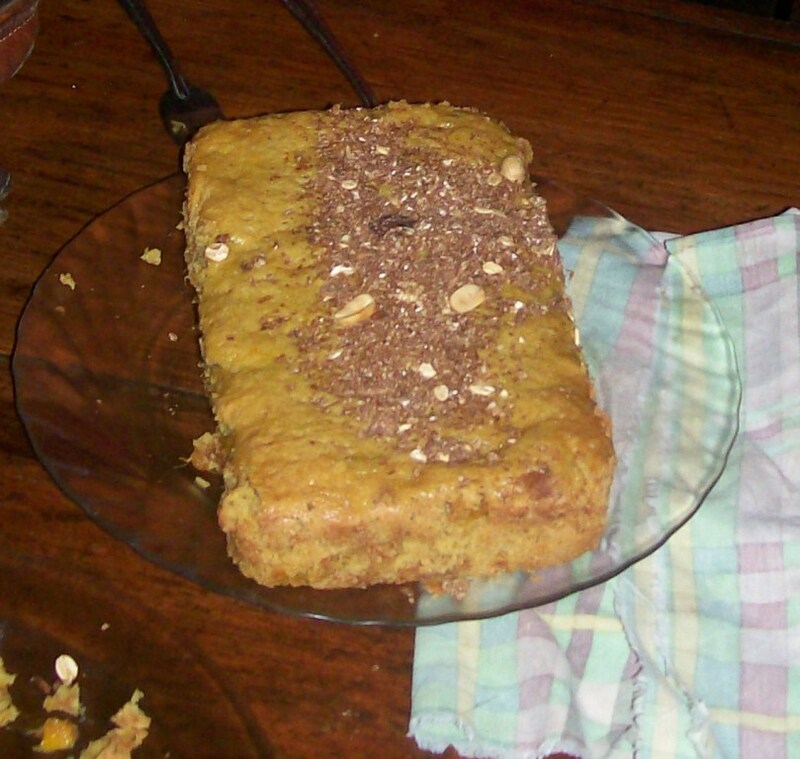 We have also tried mango cake. Our volunteers Lu and Wyatt did an awesome job! Except that Wyatt wanted to eat it straight from the dish. Lu narrowly escapes a direct mouth attack on her mango cake by Wyatt. Photo by Jeffrey McCrary. Our volunteer Lu ponders her mango creation. Photo by Jeffrey McCrary. A fabulously shaped mango loaf. Photo by Jeffrey McCrary. Smiles suggest cooking success. More mango cake, please! Photo by Jeffrey McCrary. Diverse commentaries have erupted over tilapia in the cyberdebates this month. The New York Times cited Jeffrey McCrary from FUNDECI/GAIA in a report on the health and environmental aspects of tilapia aquaculture: The Other Side of Tilapia, the Perfect Factory Fish, and many responses followed. So you thought you had a system that allowed you to calculate and balance your fish purchases between the issues of taste, cost, sustainability, and health. We agree that we have more to learn to fish wild stocks sustainably, and that fish farming can be just plain unhealthy. The bottom line is that tilapia, when grown outside the purview of the EPA in places like Central America and China, are probably bad for the environment. And no matter where they are grown, they are not nearly as nutritious as wild-caught fish. Sounds simple? Another article was published in the aquaculture sector, this time at Aquaculture Hub. I was surprised by the positive spin given the New York Times report by this journalist. Tilapia is not only an invastive species in Nicaragua which has wrecked natural habitats for many native species; now we learn that tilapia grown by aquaculture is not that nutritious, according to the recent, cited report. Nonetheless, there are defenders, as the author of the article reproduced below. Environmental impacts caused by tilapia when introduced into new areas are clear, but some people don´t consider this a priority. Read it all, think about it carefully, and make your own decisions. ...Americans ate 475 million pounds of tilapia last year, four times the amount a decade ago, making this once obscure African native the most popular farmed fish in the United States. Although wild fish predominate in most species, a vast majority of the tilapia consumed in the United States is “harvested” from pens or cages in Latin America and Asia. Known in the food business as “aquatic chicken” because it breeds easily and tastes bland, tilapia is the perfect factory fish; it happily eats pellets made largely of corn and soy and gains weight rapidly, easily converting a diet that resembles cheap chicken feed into low-cost seafood. I would love to see some fast-food restaurants adopt tilapia for sandwich offerings, over their current use of pollock and cod. McTilapia anyone? KFT = Kentucky Fried Tilapia? Sounds yummy to me, so yʻall keep plugging away out there building up your fish stocks and reducing your fish feed dependence, so that we can give those farmed chickens a rest. The article repeated below and two letters were published in About Seafood. The environmental and nutritional aspects of tilapia farming have come under much scrutiny lately. 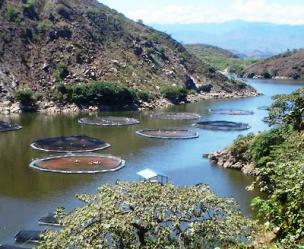 Much of the research on the environmental aspects of the tilapia business has been conducted in Nicaragua, where tilapia farming occurs using cages in natural lakes. Now that the New York Times has added its voice to the issue, the debate has intensified. As can be expected, the seafood industry spokespeople may defend the tilapia farming business vigorously, although as is noted in the response letter by the New York Times editorial staff below, the arguments given by the tilapia farming business proponents were anticipated and had been dealt with in the original article. Farmed tilapia is nutritionally inferior to most wild-caught fish, and the tilapia farming business standards, especially in farms outside the US, create huge environmental damage. The article below does not successfully contest either fact. Consumers have a right to know, and unfortunately, the fish farming industry is not prepared to inform the consumers. The article below demonstrates that some sectors of the seafood industry are not ready to talk clearly to the consumers. From a past encounter with the New York Times, one that ended with a correction from the Times and a rebuke by the paper’s ombudsman, we know that the Old Grey Lady ain’t what she used to be. But I’m not sure she’s changed for the better. Recently we brought some salient points up about the failure of the Times to abide by its own journalistic standards when producing its most recent report on fish—this time tilapia. And we heard back from an editor who, where’re not sure actually read our letter. Keep in mind her response is that she believes all of our points were “well represented” after when we just spent 700 words outline the clear, demonstrable lack of representation found in the article. The dismissive, blind defense of the Times editorial process is one perhaps Jayson Blair himself would be proud of. Watch this space for more on our interaction with the Times and feel free to read our letter below and the editor’s response. We would like to bring to your attention several breaches in journalism standards contained in an article today by Elisabeth Rosenthal [Another Side of Tilapia, the Perfect Factory Fish]. In paragraph #7, Ms. Rosenthal claims tilapia “contains a less healthful mix of fatty acids because the fish are fed corn and soy instead of lake plants and algae, the diet of wild tilapia.” Ms. Rosenthal was made aware by NFI dietitian, Jennifer McGuire, MS, RD, that the American Heart Association (AHA) “concludes that omega-6 fatty acids – found in some vegetable oils, nuts and seeds – are a beneficial part of a heart-healthy eating plan.” She ignored both Ms. McGuire’s and AHA’s expertise. In response to confusing media reports about Chilton’s perspective in 2008, an international coalition of more than a dozen doctors spoke out to clarify that fish like tilapia are low in total and saturated fat, high in protein and clearly part of a healthy diet. In explaining the specifics of different types of fat, the researchers note (consistent with AHA) that omega-6s are not only found in fish like tilapia, but vegetable oils, nuts, whole-wheat bread and chicken. The coalition, that even included another expert from Wake Forest University itself, said unequivocally that while lean fish are not rich in omega-3 fatty acids, fish like catfish and tilapia, “should be considered better choices than most other meat alternatives” and, in addition to eating oily fish, “our omega-3 needs can also be met by eating less-oily (lower-fat) fish more often.” Ms. Rosenthal simply uses Dr. Chilton as an “expert” and ignores his past transgressions in the media that a long list of credible health organizations and independent researchers have spoken out against. In paragraphs 10 and 11 Ms. Rosenthal explains the inspection and certification efforts of the WWF’s Aquaculture Stewardship Council. She also mentions the appeal of certified aquaculture facilities to “large corporate customers like Costco.” She describes the program’s “growing popularity.” But she omits facts the National Fisheries Institute brought to her attention that inspection and certification has been ongoing for years and the World’s largest retailer Wal Mart and the country’s largest grocer Kroger both already only carry aquaculture products that are certified by the Global Aquaculture Alliance. Readers are given the impression that aquaculture certification is a new and growing trend. While it is growing, it’s been around for years and major companies have long endorsed it. The WWF’s Aquaculture Stewardship Council may be new but the added food safety and sustainability aspects of such certification are not new at all. In paragraph 23 “many biologists” are reported to be worrying about tilapia farming leaving lakes dead and species extinct. However, only one is quoted. I can’t help but wonder how many were contacted for the article. In the case of the afore mentioned Dr. Chilton we provided 16 voices that stood in contrast to his often found hyperbole but none were used to counter him. Paragraph 34 notes that the Mayo Clinic advises patients that tilapia and catfish, “don’t appear to be as heart-healthy” as other fish. In our contacts with Ms. Rosenthal, prior to publication, we actually provided her with a statement from Mayo Clinic dietitians who said specifically of the tilapia debacle in 2008, “I'm going to continue to eat fish — at least twice weekly. I'm going to choose a variety of fatty fish — including tilapia and catfish along with others especially high in the good fats such as salmon, tuna and mackerel.” This clear endorsement of tilapia by the Mayo Clinic was reiterated by registered dietitian Jennifer McGuire and is not reflected in the article. We look forward to your review of this report. Thank you for the input on the tilapia farming story. With a careful reading, you will find that all the points you make about tilapia and the industry are well represented in Ms. Rosenthal's balanced, measured and expertly sourced piece. Here are a couple of recent posts on the tilapia issue. Food editors have taken note, the world over, that farmed tilapia may not be a good thing for their plates and restaurants. Please take a look and vote with your pocketbook! Historical Curiosity Update: (Monday, May 2, 3:30 p.m.) This article was slated to be on the front page of today's New York Times until the death of Osama Bin Laden caused someone to -- literally! -- shout, "Stop the presses!" And here I thought the problem with tilapia is that it tastes like nothing. Well, make that two problems: It tastes like nothing, and restaurants mark it up like a bottle of supermarket wine. Though, really, if you order overpriced tilapia in a restaurant, that's your fault, not the fish's. At any rate: Today, the New York Times drops a fascinating and troubling look at tilapia as a farmed fish and a food product. Compared with other fish, farmed tilapia contains relatively small amounts of beneficial omega-3 fatty acids, the fish oils that are the main reasons doctors recommend eating fish frequently.... Also, farmed tilapia contains a less healthful mix of fatty acids because the fish are fed corn and soy instead of lake plants and algae, the diet of wild tilapia. OK, so it's not as nutritious as you think. But at least it's sustainable, right? 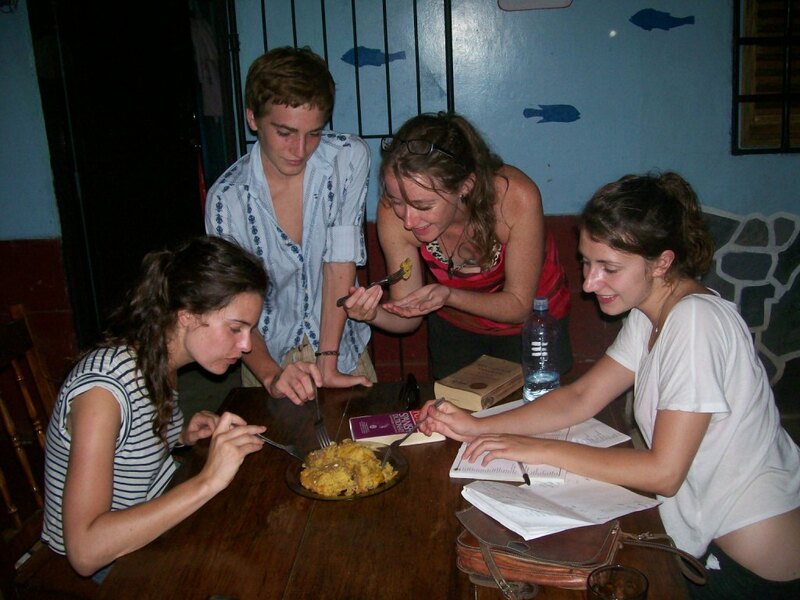 Let's take a little trip to Nicaragua. ...Dr. Salvador Montenegro, director of Nicaragua's Center for Aquatic Resource Investigation, has spent a decade fighting to close the much larger Nicanor tilapia farm in a remote corner of Lake Nicaragua. "This kind of intensive fish farming jeopardizes a lake that is a national treasure, already under stress from pollution," he said, once comparing its effect to allowing 3.7 million chickens to defecate in the water. You really should read the entire article, which details the nascent effort to introduce better environmental protections to the tilapia-farming industry in Latin America and also goes into much greater depth about the health benefits (or relative lack thereof) of eating tilapia. It should also be noted, as the article does, that while "fresh" tilapia comes to the United States mainly from aquatic farms in Latin America, the vast majority of tilapia that we eat is frozen fish from China. Indeed, in one of the article's most telling details, much of the tilapia available in stores near the fish farms in Nicaragua is frozen tilapia from China. "Nature is for maintaining species; what we do is make fillets,"
Also, there is the nugget that scholars believe the fish in the story of Jesus feeding the multitude loaves and fishes was tilapia. I hope, for their sake, one of the multitude had some lemon-garlic butter handy. Here is one from Table Hopping, the food and dining column for Timesunion. At right is a tilapia farm in Honduras. Elisabeth Rosenthal's report on the nutritional and environmental aspects of farmed tilapia has spawned dozens of internet responses. We present two more. This essay was published at the blog Organic Authority. In a NY Times article published earlier this week, Elisabeth Rosenthal digs into the tilapia industry—a fish few people had heard of ten years ago. Rosenthal writes that just last year, “more than 52 million pounds of fresh tilapia were exported to the United States, mostly from Latin America, as well as 422 million more pounds of frozen tilapia, both whole and fillet, nearly all from China, according to the United States Department of Agriculture.” Only 5 percent of tilapia consumed in America is raised in this country. Environmentalists such as Captain Paul Watson, founder of Sea Shepherd and star of Animal Planet’s Whale Wars, argue that most of the self regulated “eco” or “sustainable” fishing and aquaculture farming, like those commonly used for raising tilapia, are heavily destructive, damaging vital ecosystems by using practices the U.S. would not allow within its borders. 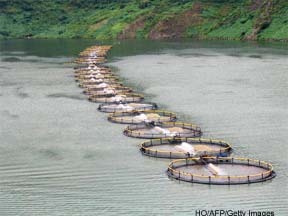 The extent of the damage to Lake Apoyo in Nicaragua from one relatively small cage had the effects of 3.7 million chickens defecating in the water, according to Rosenthal’s article. When fish is recommended in place of chicken, pork or beef, it’s often for the Omega-3 fatty acids. But in comparison to other fish, tilapia contains significantly lower levels. Salmon contains more than 10 times the Omega-3 fat content than tilapia. This occurs largely due to the unnatural diet fed to the tilapia—corn and soy, which also happen to be two of the most common genetically modified seeds. Another blog, CL Atlanta, was equally fierce, for somewhat different reasons. Why are you eating that tilapia? I've mentioned pretty frequently that I don't like tilapia. To my taste, it's the tofu of the animal world, not much better than a sop for other flavors. In fact, I like its texture less than tofu. It reminds me of the mysterious white stuff in the "fish sticks" I ate every Friday in school cafeterias. I remember when food suppliers began aggressively marketing tilapia. A friend reported going to a trade show at the time and hearing someone promote the fish as if it were a sideshow freak. "No fish has the shelf life of tilapia!" a supplier told him. "It's truly the wonder fish." I don't dispute that the fish is an excellent source of protein and that its low cost makes it an efficient addition to diets. It's called "aquatic chicken," co-opting the rep of the canned tuna known as Chicken of the Sea. It turns out that tilapia is not as healthy as we've thought — not for consumers and not for the environment. The New York Times recently published an article titled "Another Side of Tilapia, the Perfect Factory Fish" that describes the fish's reality. If you ask about the provenance of tilapia at your own market, you may discover what I did: that it was previously frozen and then thawed and put on display among fresh fish. And it was farmed in China. How can it look so good after that kind of journey? Much of the tilapia farmed in China is frozen and then treated with carbon monoxide, a gas that prevents meat and seafood from discoloring as it ages. When it is thawed, it looks like new. The Atlantic has already offered a response to Elisabeth Rosenthal's "Another Side to Tilapia, the Perfect Factory Fish", published in the New York Times. To see the digital version, click here. Ms. York points out correctly in the article that "tilapia can be raised responsibly", but what she glosses over, is that it is usually produced irresponsibly. While China is notorious for using improper food production methods in diverse products, Central America is by no means immune to the temptations to conduct unethical aquaculture practices, as Rosenthal documented. 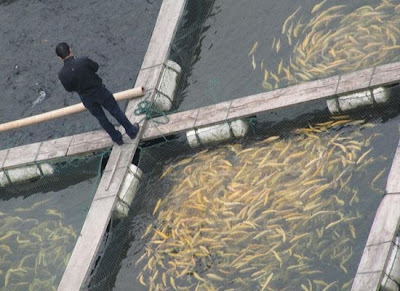 Our experience in Nicaragua has been disastrous, and we suspect that the Chinese aquaculture practices are even worse. This contribution to the tilapia aquaculture cyberdebate, nonetheless, points out that tilapia aquaculture will have a place in our future, although certainly many lessons on environmental damage and nutrition await us before we "get it right". Helene York is the director of strategic initiatives for Bon-Appetit Management Company, a national onsite restaurant company based in Palo Alto, CA. Tilapia might be the fish that people most love to hate. But hormones and industrial feed are only part of the story—and if you're careful, there can be a lot to love. Tilapia is the fish everybody loves to hate. Chefs hate it because it doesn't taste like fish. Locavores deride it because it's farmed in large, industrial pens and fed industrial soy meal. Nutritionistas shun it because it lacks the abundant omega-3 fatty acids with which they've come to associate fish. But American consumers who eat fish love it. It has gone from unknown in the U.S. in the mid-1990s to the fifth most popular seafood we eat, after shrimp, canned tuna, salmon, and pollock (think fish sticks). The collapse of the Northeast cod fishery in the early 1990s created a massive gap in the supply of "whitefish," which farmed tilapia and wild pollock were quick to fill. Guidelines are not a substitute for asking tough questions and holding seafood suppliers to high standards, especially for companies that have to identify large supplies months in advance. Tilapia's popularity is due to many things—its affordability, mild flavor, and ubiquity. That ubiquity comes at a price, however. Elizabeth Rosenthal's May 2 story in The New York Times, "Another Side of Tilapia, the Perfect Factory Fish," spotlighted the damage that many intensive tilapia farms are doing to local ecosystems, especially in China, where the Seafood Watch rating dropped from a "good alternative" to "avoid" four years ago. China produces 89 percent of the 475 million pounds of tilapia that Americans consumed last year, Rosenthal reports. Yet tilapia is no different than any other "crop." It can be raised responsibly and irresponsibly—including in China. When Seafood Watch changed its rating on tilapia from yellow to red for the Chinese-grown tilapia, I remember uttering a word I can't publish and wondering what to do next. I can take or leave tilapia myself, but millions of college meals depend on an affordable supply of a fish that college students will actually eat. Because the more than 400 cafes run by the company I work for, Bon Appétit, are committed to following the Monterey Bay Aquarium's Seafood Watch guidelines, I couldn't ignore the change in status. Lots of our tilapia came from China. We had a choice. We could source "green"-rated tilapia from Latin America, which was mostly delivered "fresh" by air freight, contradicting one of our core sustainability principles (because emissions of air shipping are 10 times worse than shipping frozen products), or try to encourage the development of a role model in China. Our supplier, a European company that owns farms in China, wanted to keep our business. So with the supplier's cooperation, we asked independent scientific advisers to evaluate their tilapia farms. The evaluator reviewed our supplier's documentation and went to see the operations in China firsthand. There, he verified their claims and suggested some improvements they have since implemented. Unlike many new farming operations, our supplier has sited pens in water channels where the tilapia cannot escape and over-run native species, collects and disposes of fish waste properly to maintain stringent water-quality standards, and never administers antibiotics or hormones. (Among the disturbing facts in Rosenthal's piece was that baby tilapia are routinely fed testosterone.) 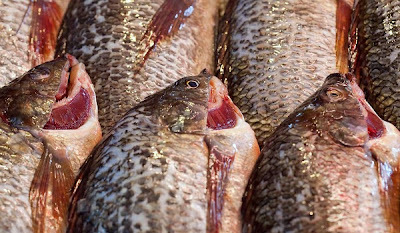 And in the end, Seafood Watch agreed that this producer's operations met the criteria for a "good alternative," despite its countrywide "red" listing for Chinese tilapia. Bon Appétit believes strongly that it is better for a large purchaser like us to help drive change and reward good producers than just to cherry-pick from the top producers. Seeking out a large supply of sustainable seafood is neither a simple endeavor nor a static one. The science-based recommendations offered by Seafood Watch and Blue Ocean Institute are an important starting point for us and for individual consumers, because they represent a snapshot of current knowledge about a moving target (just like the fish themselves). But they are not a substitute for asking tough questions and holding seafood suppliers to high standards, especially for companies that have to identify large supplies months in advance, rather than simply choose dinner off a restaurant menu. The advantages of eating fish are many; unfortunately, fish consumption in the U.S., especially if you exclude breaded deep-fried fish, is extremely low. Fish offers heart-healthy omega-3 fatty acids and is low in calories and saturated fat. 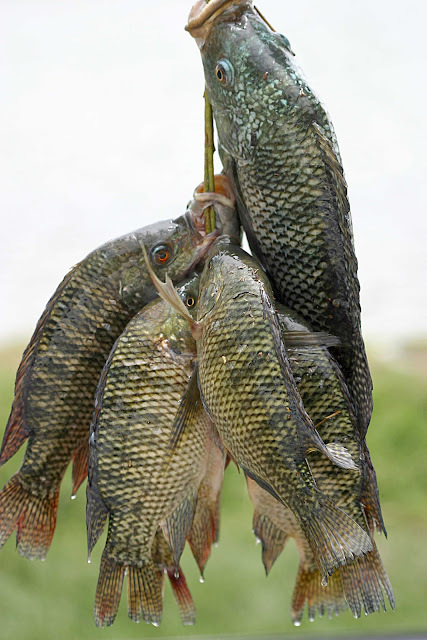 Tilapia happens to be lower in fat than some other fish, so it has less of all types of fatty acids. Tilapia is, however, more affordable than most other fish in the market today. Splitting hairs over whether one fish has less omega-3 fatty acids per serving than other types of fish when the total fat content is low seems to miss the point. 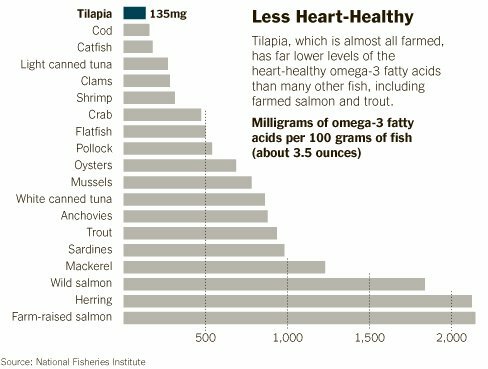 Let's get people eating more fish, and then worry about fine-tuning either the fish's diet or our diet to edge up the omega-3 content. I couldn't agree more. There's no arguing that fish such as sardines and wild salmon have nutritional qualities that are considered superior, but not everyone will eat "fishy" fish. (Most Americans, it seems, won't.) Bon Appétit serves 120 million meals a year. We have to please a lot of palates, so we offer a variety of protein choices that introduce new options to consumers who otherwise might opt for burgers and fries at every meal. So when tilapia is farmed responsibly, we all win. Para los que prefieren leerlo en espanol, aqui repetimos un recorte de un blog sobre desarrollo rural en Mexico, donde aparece el debate sobre la conflictiva tilapia. Este capitulo del debate se inicio con un articulo en el New York Times. Es interesante que este tema tome vuelo en un pais donde se ha sembrado tilapias en muchisimas aguas naturales. Para leer el blog, haga clic aqui. ELISABETH ROSENTHAL. NEW YORK TIMES. Una historia bíblica muy conocida cuenta que Jesús alimentó a 5 mil personas con cinco panes y dos peces, los cuales, conjeturan los académicos, eran tilapias. Sin embargo, en la granja de peces Aquafinca, en Agua Azul, un milagro moderno ocurre diariamente: decenas de miles de tilapias carnosas, aleteando al salir del agua, son sacadas de jaulas atestadas en el Lago de Yojoa, convertidas en filetes en un rastro frío y rápidamente llevadas a aviones con destino a Estados Unidos, donde algunas harán su aparición en platos en espacio de 12 horas. Los estadounidenses comieron 215 millones de kilos de tilapia el año pasado, cuatro veces más que hace una década, lo que convierte a esta variedad nativa de África, antes poco conocida, en el pez de granja más popular en EU. Aunque los peces salvajes predominan en casi todas las especies, la enorme mayoría de la tilapia consumida es "cosechada" de corrales o jaulas en Latinoamérica y Asia. Conocida en la industria alimenticia como "pollo acuático" porque se reproduce con facilidad y tiene un sabor insípido, la tilapia es el pez de granja perfecto; come con gusto bolitas cuyos ingredientes principales son maíz y soya, y engorda con rapidez, lo que convierte facilmente una dieta semejante a alimento barato para pollos en un marisco de bajo costo. La tilapia de granja es promovida como buena para la salud y el medio ambiente, en un momento cuando muchas poblaciones marinas se han visto muy reducidas. Comparada con otros peces, sin embargo, la tilapia de granja contiene cantidades relativamente pequeñas de ácidos grasos omega-3, los aceites de pescado que son la principal razón por la que los médicos recomiendan comer pescado con frecuencia; el salmón contiene más de 10 veces la cantidad de omega-3 que la tilapia. "Puede parecer pescado y saber a pescado, pero no tiene los beneficios; podría ser perjudicial", expresó Floyd Chilton, profesor de fisiología y farmacología en el Centro Médico Bautista de la Universidad Wake Forest, en Winston-Salem, Carolina del Norte. Los defensores de la acuicultura de tilapia señalan que esta industria joven y en rápido crecimiento ha empezado a mejorar sus estándares. El Aquaculture Stewardship Council, creado por el organismo de conservación Fondo Mundial para la Naturaleza (WWF) e IDH, programa de comercio sustentable holandés, está en proceso de iniciar un programa de inspección para las granjas de tilapia. Las aprobadas recibirán etiquetas que identifican sus peces como "criados con responsabilidad". Aquafinca se ha convertido en la primera en aprobar una inspección. Nativa de los lagos africanos, la tilapia fue empleada en muchos países tropicales pobres en la segunda mitad del siglo 20 para controlar la maleza y los mosquitos. Esa "tal vez no fue la mejor idea", dijo Aaron McNevin, biólogo del WWF quien trabaja en normas para las granjas de tilapia, porque "es una de las especies más invasivas conocidas y es muy difícil erradicarla una vez que está establecida". Para los 90, los negocios vieron una oportunidad en la cría en granja de esta robusta especie. A través de la reproducción selectiva, los científicos crearon las variedades industriales de la actualidad: peces grandes y carnosos con cabezas y colas diminutas e intestinos que les permiten absorber los alimentos más rápido. La tilapia de granja alcanza su peso de venta de alrededor de un kilo tras aproximadamente nueve meses de alimentación intensiva. Para los consumidores que compran tilapia de China, Honduras o Ecuador, hay poca orientación. "Es tan complicado para los consumidores decidir qué comer, ahora que la producción de la acuicultura está en tan rápida expansión", señaló Peter Bridson, gerente de investigación de la acuicultura del Acuario de la Bahía de Monterey, California. El acuario produce la popular Seafood Watch, guía del consumidor independiente a cómo comprar pescado sustentable. Por el momento, Seafood Watch califica la tilapia criada en EU como la "mejor opción", la de Latinoamérica como una "buena alternativa" y sobre la de China, dice que "debe evitarse". Bridson comentó que estos ratings aproximados se basaron, en gran medida, en la presencia de un monitoreo efectivo en esos sitios y en cómo se deshacían las granjas de sus desechos. Sin embargo, a muchos biólogos les preocupa que el gran negocio de la cría de tilapia pese más que la cautela y deje lagos muertos y especies extintas. Jeffrey McCrary, biólogo de peces, ha pasado la última década estudiando cómo una pequeña granja de tilapia de corta existencia degradó el Lago Apoyo en Nicaragua. "Una pequeña jaula echó a perder el lago entero, ¡todo el lago! ", dijo de la granja, que operó de 1995 al 2000. Los desechos de las jaulas contaminaron el ecosistema, y algunas tilapias se escaparon. Una planta acuática llamada chara, alimento importante para los peces, desapareció y eso dejó al lago convertido en un páramo. Hoy en día, algunas especies de plantas y peces se recuperan lentamente, pero es probable que otras se hayan perdido para siempre, mencionó McCrary, quien trabaja para la fundación FUNDECI nicaragüense. Salvador Montenegro, director del Centro para la Investigación en Recursos Acuáticos de Nicaragua, ha pasado una década en la lucha por cerrar la granja de tilapia Nicanor en el Lago de Nicaragua, porque, dijo: "pone en peligro un lago que es un tesoro nacional". Los peces más débiles, como el róbalo arco iris, han empezado a desaparecer del lago. Sin embargo, David Senna, gerente de Nicanor, aseguró que las jaulas empleadas por la compañía ocupan sólo una fracción minúscula del lago, en un área con corrientes lo suficientemente fuertes para llevarse los desechos de los peces. Para los médicos, el debate se ha centrado en el valor nutritivo de la tilapia. Bruce Holub, profesor de ciencia nutricional en la Universidad de Guelph, en Ontario, dijo que la tilapia es una fuente de proteína y contiene algo de omega-3. Sin embargo, a otros les preocupan las investigaciones que muestran que la cantidad de otro tipo de ácidos grasos, los omega-6, es mayor que los benéficos omega-3 en la tilapia de granja en una proporción de 2 a 1. Algunas investigaciones sugieren que dicha proporción incrementa el riesgo de cardiopatía. Gran parte de la tilapia en los mercados mundiales proviene de China, cuyas granjas de peces son consideradas mal reguladas. China exporta los peces congelados y empacados en monóxido de carbono para preservar su color y apariencia fresca cuando son descongelados para la venta al menudeo. "La gente quería pagar alrededor de 8 dólares por kilo de este pescado congelado, en lugar de alrededor de 12 dólares por el fresco, especialmente durante la recesión", dijo Senna. Es por la mala regulación de las granjas chinas, señaló Bridson, que la industria necesita normas más claras. Hasta entonces, el producto más barato ganará. "Si tengo 100 tilapias en un estanque, puede que sean tilapias felices porque tienen espacio para nadar, pero no podré venderlas debido a que no tendré acceso al mercado global", expresó McCrary. Blake Schmidt contribuyó con reportes desde Managua, Nicaragua. Para contactarnos, haga clic en el escudo. One sign of quality habitat in a natural tropical forest is the presence of army ants. They attack small animals, especially invertebrates, and devour them in mass. They are active during the day, and tend to choose a different roost site each night. We have been invaded by army ants recently in Estacion Biologica, which provide for us a kind of Spring cleaning. Columns of marauding ants march into rooms and swarm through crevices, under and behind furniture, in search of prey. Within hours, they are gone. See video here. This army ant column passes a ripe capulin (Muringia calabura), in search of more substantial food. Photo Jeffrey McCrary. Larger workers like the individual in the center of this picture are often called soldier ants, although their activities may overlap considerably with the smaller workers. Photo Jeffrey McCrary. A column of army ants moves past a capulin fruit. Photo Jeffrey McCrary. Columns in movement may divide and re-merge, as the ants seek prey. Photo Jeffrey McCrary. This group of army ants occupied many associated columns and number well into the thousands. Photo Jeffrey McCrary. Although the most well-known species of army ants in Central America is Eciton burchelli, the species found in Laguna de Apoyo Nature Reserve, Nicaragua, is not known. Pesticide use in habitations inside the reserve threatens their continued existence. Photo Jeffrey McCrary. Army ants live in symbiosis with a number of other animals that feed on the animals which escape the reach of the army ants, thus exposing themselves to other predators. Most notable among them are the so-called antbirds, which actually feed on other small animals, not on the army ants. Some antbirds maintain a strict association with army ant swarms. Photo Jeffrey McCrary. 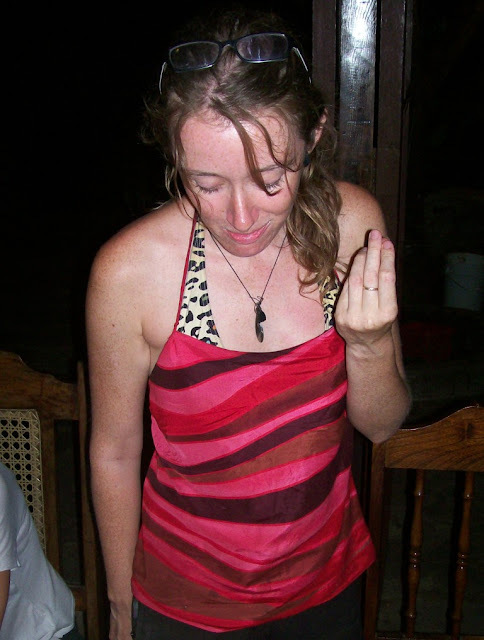 We know almost nothing of army ants in the Pacific region of Nicaragua. Photo Jeffrey McCrary. "Progress" is arriving in Nicaragua, and with it, the forests of the Pacific region are under grave threats. ﻿﻿﻿﻿﻿How much longer will we be able to enjoy the marvel of army ants in Laguna de Apoyo Nature Reserve? Every day more pressures can be found against nature here. For now, the army ants are one more sign that the forest in the Apoyo crater is still quite "natural". But until when?